Nice is an executive / luxury coaches targeting upper middle class passengers including senior working executives and business travelers. Nice was one of the firsts in the country to introduce “executive coaches” with full on-board services hosted by a steward/stewardess throughout the journey. 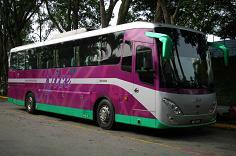 Their executive coach is equipment with video on demand and pantry facilities.